This body is made to vintage specs using real/vintage bodies as templates to create templates on our pin router. A 1962 Jazzmaster was disassembled. 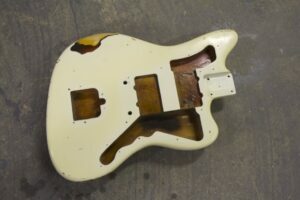 A piece of Baltic plywood was secured to the Jazzmaster body through the original neck screw locations. our J bodies. This is a nerve wracking method of generating accurate templates because of the value of these original guitars, but no guitars were damaged in the process. This method of generating a template is far superior to tracing a body, because the pin of the pin router rides exactly perpendicular to every edge picking up all the details of the factory routes. Keep in mind that original bodies have radiused edges which prevents them from being traced as precisely as our method. An interesting fact about factory made guitars in the early years: If you could examine a group of factory (same model) bodies closely enough, you would be able to notice differences between them. Factory employees worked at a rapid pace back when pin routers were in use for producing bodies. This rapid pace meant that the templates (with body blanks attached to them) were being slammed against the pin of the pin router. The templates were made of wood and the pin was made of steel, so you know there were tiny dents and imperfections created on these master templates with each use. These dents and imperfections were then transferred onto each new body being produced. A new dent in the template meant a new dent in the body being routed. Did you ever notice that early guitars have routes that aren’t very Geometrically precise? Circles aren’t round, straight lines aren’t straight etc. Part of the reason is that those shapes were generated on the master templates with hand tools, but they were also banged against that steel pin of the pin router which created further imperfections. In a nutshell: Our 62 J-style bodies have perfectly captured the imperfections of one particular 1962 Jazzmater body. All our Vintage Spec bodies were developed from original factory guitars using this same pin routing technique.